Casement windows will do more than just enhance the beauty of your, they will also increase your comfort like no other window. With their side-hanged sash and easy-to-use hand crank, there’s just no comparison for the quality or convenience. 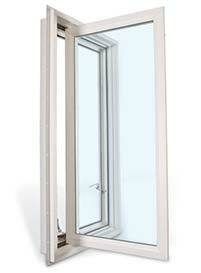 Casement windows come with standard folding operating handles. Windows open to 90° for easy cleaning. Double fastening hardware is mounted through at least two walls and multi-point locking system means high security. What’s the number one thing that casement windows do better than all other windows? Airflow. Unlike other windows, casement windows can be opened 90°. When they are opened all the way, the sash is partially centered, which means you can get the most out of a nice summers breeze, no matter what direction it blows. These exterior opening windows adapt perfectly to any style of home. Easy to operate, easy on the eyes, and high on performance. Let 1st Choice Home Solutions install your casement window with our professional and quick installers.